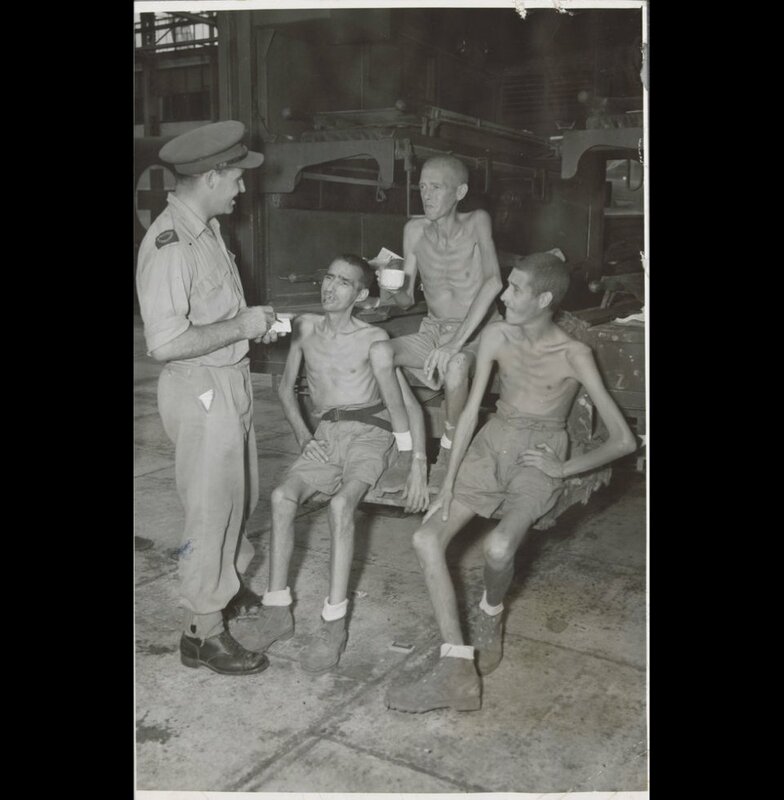 Three extremely thin and emaciated liberated Allied and Australian POWs from Palembang, Sumatra, speaking with a British war correspondent in Singapore, 1945. Image courtesy of Argus Newspaper Collection of Photographs, State Library of Victoria. 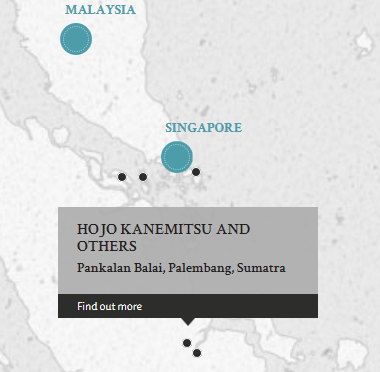 Defendants were alleged to ill-treat British and Dutch POWs at Pankalan Balai POW Camp. In particular, the first defendant, Hojo Kanemitsu, was said to fail to maintain appropriate and adequate discipline among his Korean guards. The Korean guards, who were also defendants in the case, were said to beat up POWs. This resulted in the mental and physical suffering of the POWs. Each Korean guard had a set of nicknames by the POWs, based off their appearance or behaviour towards the POWs. These nicknames was used in court and in the evidence produced. Case also mentions the "Pritchard Incident" - the incident where four POWs got out of the POW camp during the vicinity in order to get some food. The POWs were not motivated by a desire to escape, but because of hunger. Hojo, Kanemitsu. Captain. From Japanese military. From Japan. Guilty. 10 years' imprisonment. Sentence reduced. 4 years' imprisonment. Tokuyama, Naokichi. Korean Guard. From Japanese military. From Korea. Guilty. 10 years' imprisonment. Sentence reduced. 5 years' imprisonment. Tokuyama, Konko. Korean Guard. From Japanese military. From Korea. Guilty. 3 years' imprisonment. Sentence confirmed. Ohara, Teiman. Korean Guard. From Japanese military. From Korea. Guilty. 12 years' imprisonment. Sentence reduced. 6 years' imprisonment. Motoyama, Shigeki. Korean Guard. From Japanese military. From Korea. Guilty. 7 years' imprisonment. Sentence reduced. 3 years' imprisonment. Iwamoto, Moshaku. Korean Guard. From Japanese military. From Korea. Guilty. 3 years' imprisonment. Sentence confirmed. Matsumoto, Eitaku. Korean Guard. From Japanese military. From Korea. Guilty. 5 years' imprisonment. Sentence reduced. 3 years' imprisonment. Hirayama, Chuchin. Korean Guard. From Japanese military. From Korea. Guilty. 2 years' imprisonment. Sentence confirmed. Hassan, Teufiq. Captain. From British Indian Army. D'Abreo, V. L. A. From British Indian Army. Eber, J. F. Civilian. Barrister at Law. Cleyndert, L. D. Lieutenant. From Dutch military. Healy, J. F. Captain. From British military.